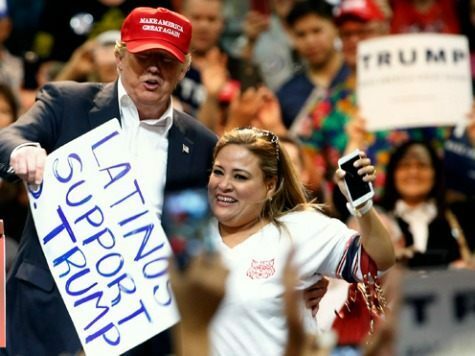 Trump picked Betty Rivas and her “LATINOS SUPPORT D. TRUMP” sign out of the crowd and brought her onstage during a Saturday rally in Tucson. Rivas told KGUN9-TV that since the incident, she has received harassing phone calls at her and husband Jorge’s Mexican restaurant, vulgar comments on both her and the business’ Facebook pages, and received malicious restaurant reviews on Yelp for Sammy’s Mexican Grill in Catalina. Rivas has been shocked by the backlash from her Trump sign, according to the report. However, Rivas said she received no such response from Trump supporters after taking a similar sign to the Tucson Bernie Sanders rally. Mrs. Rivas told the local news outlet that she has the right to say what she thinks and can listen to Trump or Bernie or Hillary Clinton if she chooses. KGUN9 took screenshots of some of the obscene Facebook comments before they were deleted, which may be viewed in the media player on KGUN9’s website. Over the course of Tuesday, the restaurant’s rating actually went up from all the reviews posted in support to counter the nasty ones. I’m of Mexican Decent and do not believe in Leftist Latino Politics! I was raised in an American household with all the traditions of a Mexican family. I am going to drive down from Phoenix just to eat in this woman’s restaurant, because I believe we have the right and the choice to support whomever we like and should not ever be intimidated by thugs of leftist politics. Pima County law enforcement is looking into the threats against Rivas, according to the local news report. The presidential preference election, which offered up 58 Republican and 75 Democratic Party delegates, took place Tuesday.